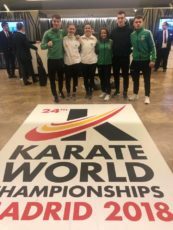 Ten Karate Ireland ONAKAI athletes will be competing at the Karate World Championship in Madrid this week, with a target of gathering points on the qualifying table for the Tokyo Olympics in 2020, where Karate will feature for the first time on senior level. Competition takes place from the 6 – 11 November. The two-year qualifications for Tokyo commenced in July of this year and will run until 6th July 2020. While athletes have several opportunities to accumulate points, the highest number will be available at the WKF World Senior Championships in Madrid. The first event on the programme will be the eliminations rounds across all the categories. First up for Ireland is Una Flynn competing in the Elimination Round in kata, competing in pool 2. Ruairí Dougal will also be in action, competing in Male Kumite +84kg, Pool 1, as well as Sean O’Connor in Male Kumite -84kg Pool 3. Caradh O’Donovan is the currently highest ranked athlete, currently ranked on the Tokyo qualification list at 96th place. 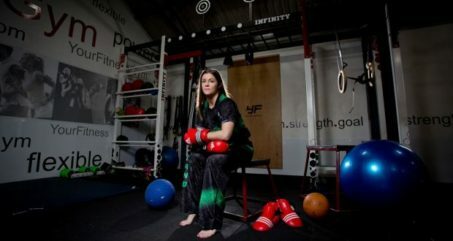 The former international kickboxer will test herself against the world’s best in Female Kumite -61kg on Wednesday 7th having received a bye into the second round. Her first competition will be against Jordan’s Aseel Alnaimi. Over the next two years Irish athletes will have an opportunity to acquire ranking leading to selection for the elite few qualification places, in addition to which athletes will have an opportunity to qualify during the European Games (June 2019) or the WKF Qualification Tournament (Paris, May 2020).